Oh, sure, Lollapalooza’s lineup has been announced, but fans planning on attending Coachella have a more pressing concern. 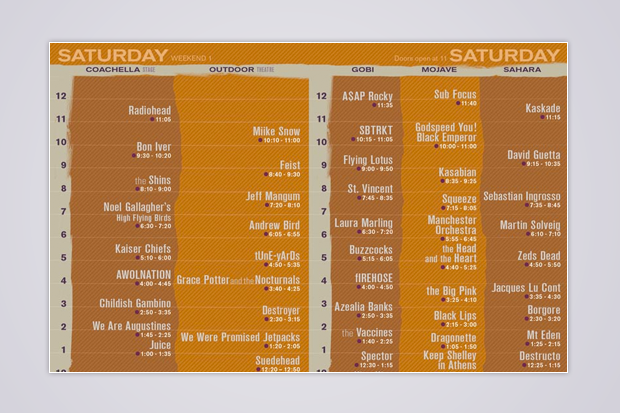 With the first round of the two-weekend music festival now only a couple of nights away, organizers have revealed the set times for all the acts descending upon the Indio, California, desert. The good news is at almost any point you’ll be able catch an intriguing performance whichever way you turn; the bad news is you can’t see ‘em all. We’ve listed the five toughest decisions you’ll face at Coachella — and we’ve provided a little unsolicited advice we hope can help. And no, whether to stay for Dr. Dre and Snoop Dogg or head home early to beat the traffic isn’t even a choice, despite our disappointment that Warren G has thrown cold water on rumors he and Eminem would be joining them up there. One more reason for optimism: With two weekends to choose from this year, maybe you’ll be able to fill in any bands you miss on the second go-round. Battle of the buzz bands! This one will likely be a matter of taste. If you’re in the mood for visceral punk-rap, Death Grips, who make their major-label debut on April 24 with The Money Store, are your best bet. Prefer sumptuously arranged guitar-pop classicism, sung by a frontman who invests simple lyrics with a deep, and sometimes deeply troubling, sincerity? Girls, who recently proved their live mettle at SXSW, won’t disappoint. Recommendation: Death Grips. As much as it pains us to say it, in a festival setting, bludgeoning aggression generally trumps painstaking craftsmanship. Or you could ignore this decision altogether and see one of Lollapalooza 2011’s best, local-band-made-good Grouplove, leading into John Fogerty-approved fellow-Los-Angelenos Dawes (and you’d be in prime position for indie-folk mainstay M. Ward). Hey, we said this was tough. Recommendation: Ugh. We say Pulp, if only because they’re great and you probably won’t get the chance to see them again. With any luck, Ocean will be back, though more than likely on a bigger stage. This is a no-win situation. Or a win-win, depending on how much sunscreen you’ve brought this weekend and how you’re feeling about life. These overlapping sets pit the bluesy glam-rock swagger of the Black Keys against the towering post-rock instrumentals of Explosions in the Sky and the euphoric, ’80s-refracting electro-pop of M83. It’s like the musical equivalent of living in a beer commercial against Friday Night Lights against the films of John Hughes. Recommendation: The Black Keys. You can see them and still catch the reformed Mazzy Star after Pulp, and you’ll have time to get back for Refused if you don’t want to stick around for Swedish House Mafia. And as much as we love M83, at that point in the night we’d rather be fist-pumping than swooning. We guess there’s some way could catch parts of more than one of these sets, but you’d still be seeing only bits and pieces. So what’ll it be: A rare live appearance from a shadowy Canadian R&B act (and Drake associate) responsible for three terrific free mixtapes last year, a Belgian-Australian singer-songwriter with a Sting-like ear for lilting melody and a sleeper pop hit for the post-Adele world, or the hedonistic French electronic dance duo with classic-rock swagger? Recommendation: This is another tricky one, of course, but we’d go with the Weeknd, especially since we’ve already forsaken our beloved Frank Ocean for our beloved Jarvis Cocker. It’s the first stateside performance from a singular talent, and even if lascivious slow jams like “What You Need” inexplicably fail to come across in concert, you’ll be sure to witness something unexpected. Oh, sure, for most of you this won’t be a decision. Radiohead is a fantastic festival band, and by virtually all accounts they’ve really pulled out all the stops on their recent tour, unveiling new songs and rarities never before played live. They’re Radiohead. But if moody British art-rock isn’t your speed, you’ll still be faced with choosing between one of the leading lights of the electronic dance music — at a time when the movement is gaining mainstream and even Wall Street recognition — against a hotly touted Harlem rapper who recently made the internet go nuts with a Lana Del Rey collaboration. Swag, swag, swag. Recommendation: Radiohead. Rocky’s meandering SXSW set suggests there’s no point fighting off the popped-collar bros amped up on Red Bulls to crowd into this one, and since we’ll still have Sunday to go, we’d rather drift off to “Karma Police” than dance into the wee hours with Kaskade’s club-ready beats. But your personal mileage may vary. Recommendation: Kendrick Lamar. Indie rock is great, but at festivals it can be nice to break up all the midtempo earnestness with something different. Lamar is an exceptionally skilled rapper who probably deserves higher billing — and may soon get it, considering his Black Hippy crew’s jump to a major label — and besides, he has a location-appropriate banger of his own. When it’s 82 degrees and tops are peeling off, this is where you’ll want to be.